In MLV we are a group of people with deep knowledge of Mykonos and strong passion for elite traveling. 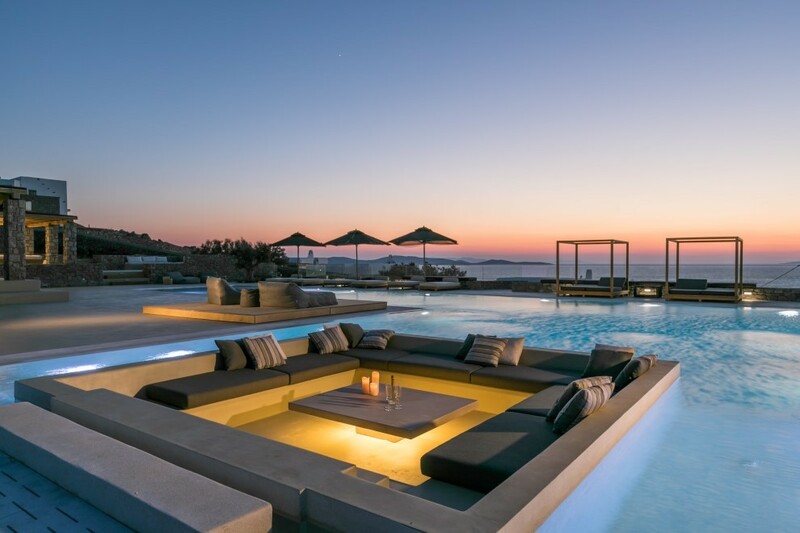 We have created a big portfolio with the most lavish villas available for rent all over the island and we aim to completely satisfy our guests’ needs, from the moment they arrive in Mykonos till the last minute of their vacation. The villas strictly chosen for our rich portfolio have to meet very high standards and when needed they get partially or fully renovated to become little palaces for the most demanding guests. Our expertise MLV Concierge Team offers exclusive concierge services to our clients, covering a big range of personalized administrations. Our impeccable services include luxury cars and limousine rentals with or without a driver, private spa treatments by professional therapists in your own space, in-house private chefs, luxury yachts with full crew for your sea adventures, personal training with the best experts, charter private jets or helicopters and security or bodyguard services. Situated on the hills near Agios Ioannis beach, Mykonos Villa Cara Mia offers absolute privacy as it is built on a plot of 7000 square meters. The beach is only 400 meters away and the distance to Mykonos Town just 3 kilometers. The villa consists of 6 bedrooms and a capacity of 14 guests. A huge infinity pool dominates the outdoor area, facing to the Aegean Sea and the islands of Paros and Naxos. A pool bar, a Jacuzzi and comfortable wooden sun loungers make the outdoor area perfect to relax the whole day. The bedrooms and the living rooms are spacious and decorated with high aesthetics, offering a warm and inviting environment for a comfortable stay. The bedrooms on the upper floor have their own private balconies offering breathtaking view as well. 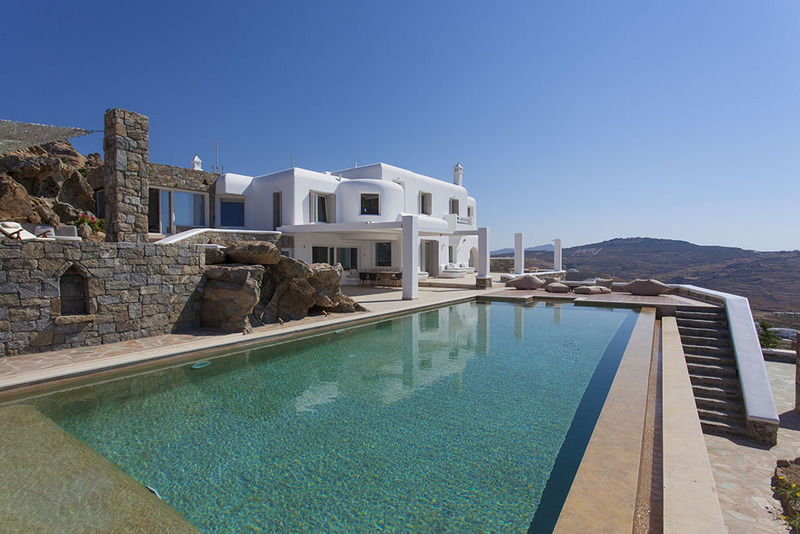 This gorgeous luxury Mykonos Villa Aqua Blue is located at the peaceful Agios Stefanos area. The ground floor includes one master bedroom and 4 double bedrooms, while 2 more master bedrooms share the upper floor. A fully equipped kitchen and a large sitting room complete the ground floor. At the outdoor area you will find a big swimming pool, a BBQ, a Mediterranean Garden, a pool bar, a veranda with a dining table and the exit to a private path leading to the beach, just a few steps away. 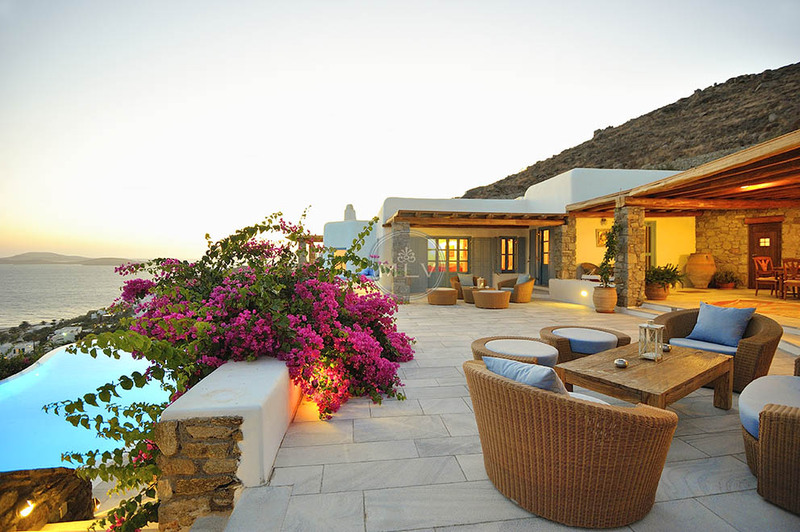 A stunning villa built on the slope of a hill just outside Mykonos Town. Villa Mediterranean Blue is composed of 9 bedrooms, 3 of which are master bedrooms each with its own private bathroom on the second floor. The addition of some stone walls creates a unique, natural and friendly environment. The outdoor area includes a lighted tennis court, a large swimming pool, 3 comfortable sitting areas, a dining table, a BBQ and a wonderful garden with paths for walking. Villa Allure is located on a hill near the beautiful sandy beach of Elia. It consists of 2 levels and an independent guest house for even more privacy. It consists of 12 bedrooms, a fully equipped kitchen and an indoor steam room. The sitting and dining room is spacious with beautiful wooden furniture. Around the overflowing swimming pool just in front of the villa, you will find 2 more sitting and dining areas with comfortable sunbeds and sofas, a wood fire BBQ and pergolas. Villa Mystique is one of the smallest properties, having just 4 bedrooms and a capacity of 8 guests. It offers great views to the Aegean Sea and Delos islet and very high isolation, as its private land extends to 5.000 square meters. Situated above Agios Ioannis beach, offers a big swimming pool, a beautiful garden with bougainvillea and olive trees, a BBQ and a Jacuzzi. to our clients, covering a big range of personalized administrations. Our impeccable services include luxury cars and limousine rentals with or without a driver, private spa treatments by professional therapists in your own space, in-house private chefs, luxury yachts with full crew for your sea adventures, personal training with the best experts, charter private jets or helicopters and security or bodyguard services.